Mom and Dad have always embodied the Christmas spirit. 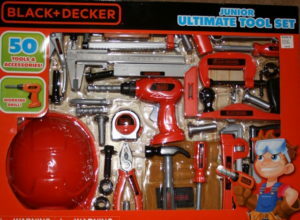 They gifted us kids with things we needed, wanted, or would just die if we didn’t find under the tree. But that isn’t the Christmas spirit I mean. They shared Christmas spirit when they taught us kids to care for others, and to donate when we could. Oh, the things a child can imagine building. What sits at the top of my mom’s Christmas list? “Donations to your charity of choice.” What sits at the bottom of my mom’s Christmas list? The same item! What’s at the top of mine? “Donate to the National MS Society,” followed by “Donate to your favorite charity.” Thanks to the work ethic my parents instilled in me, a solid education, working two jobs in the early years to pay off my loans, and a lot of good luck, I’m blessed to have the ability to donate and keep the Christmas spirit alive. Bike Lady stopped by my house the year I bought two bikes for her. One of my favorite charities embodies the Christmas spirit year ’round on two wheels: Bike Lady. 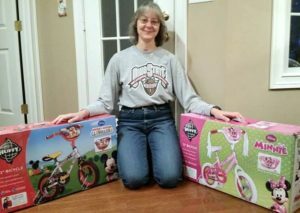 This charity exists because in 2008 one woman, Kate Koch, decided to buy a few bikes to give to Franklin County Children Services for their Holiday Wish program. That program exists solely on donations. But Kate didn’t stick with her plan. By the time she rolled through checkout, she’d purchased twenty-six bikes. As Kate walked past the other checkout aisles, a hush fell. Then the buzz began, seeking the story of one lady and twenty-six bikes. Before she’d left, Kate held money in her hand from other shoppers, telling her to buy more bikes. Bikes arrived on her doorstep; checks, in her mailbox. Kate never meant to form a charity, but what could she do? She’d found a need; and the public had responded. Central Ohio bicycle groups jumped in with donations of their own. I belong to both Columbus Outdoor Pursuits and Westerville Bicycle Club, and know the generosity both have had over the years as they could afford it—COP, as much as $5,000 several years. I’ve donated to Bike Lady eight years running; Kate has become a friend. My Mom and Dad’s business, Dynamic Specialties, has donated the past few years as well—they know how important my bicycle has been in my health, my sense of adventure, my identity. Long before my nephew served in the Marines, my family bought toys for the Toys for Tots campaign, or the FireFighters 4 Kids campaign if we could make that drop-off. 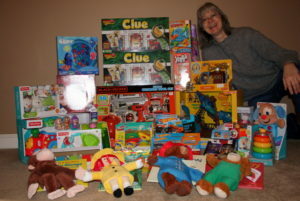 The past three years, it’s been my own community’s FireFighters for Families Food and Toy Drive, helping out families at Christmas. These days, Mom prefers I do the shopping. When her check arrives, I ante up my funds and get to shopping. 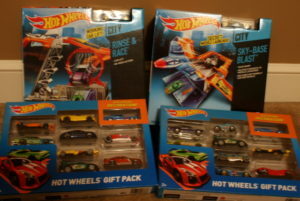 The goal is cool toys, but always at 40%, 50% or 60% off; even better when I have a coupon from one of my favorite big-box stores, and can take another 20% or 30% off the total; or get “cash” coupons to use the following week. Before I know it, I’ve got a carload of gifts. But I’m not done. Books. Books must always be part of the donation. Always, always, always and a day. I am who I am because of books; I am successful because of books; I’m creative because of books; I’m a writer because of books. I’d ask for, and receive, books at Christmas; and, and, and! The past few years, I’ve bought via the Kohls Cares for Kids campaign because the hardbound picture book is $5, and a matching stuffed animal is $5. Given my OCD nature, I can’t help but scoop up every pair, even when that puts me over budget. True to their nature, Paddington Bear and Curious George made a break for it as we headed for the fire station door this morning. The grocery bag with those two devious critters mysteriously ripped, and the stuffed animals headed for the pavement. Curious it is, Curious George, how you managed to separate yourself from your book, though I’d tied them together with a ribbon. 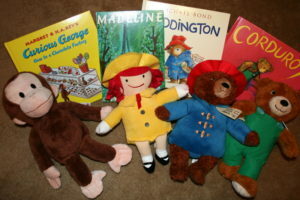 Sorry, Curious George, you’ll have to stay with your book until you’re in a child’s home, sharing the Christmas spirit. Then you can take your child on an adventure or two. If I passed the Salvation Army kettle as a kid shopping at the Mentor Mall, I emptied my pocket of any coins and put them in the kettle. I think Mom created that tradition with her Christmas spirit. These days, if I don’t have pocket change, my rule is the lowest bill in my pocket. To my chagrin this year, I passed a kettle, and the only money I had was the twenty dollars I had just gotten as part of choosing cash back at checkout. Into the kettle it went. I hold this Christmas spirit dear because of Mom and Dad’s generosity, their love, their sacrifices. Do you have a tradition of giving tied to Christmas, or the holiday you share at this time of year? I’d love to hear about it. This entry was posted in Giving Thanks, Holidays, Life Lessons, Uncategorized and tagged bike, charity, Christmas, dadlife, Family, holiday, lifelessons, momlife, tradition. Bookmark the permalink.